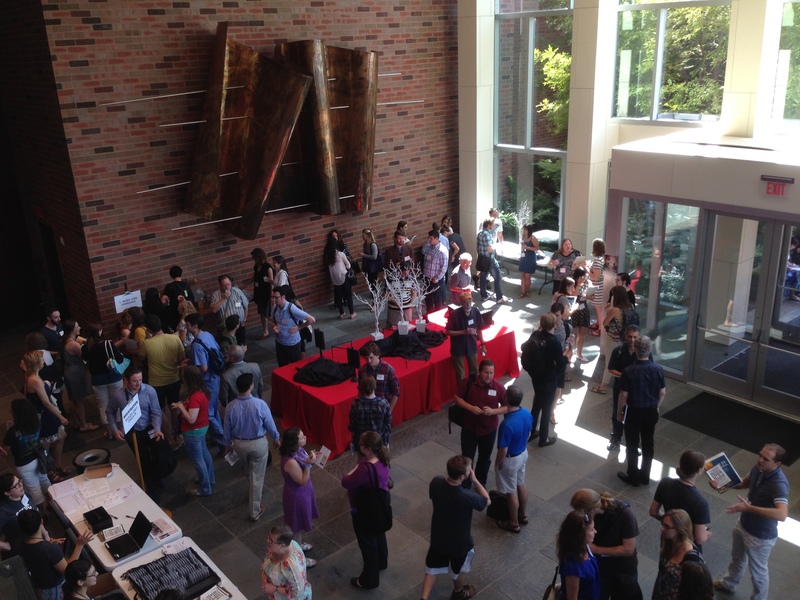 This week (August 1-5) Vanderbilt University hosted the biennual Conference of the Society for Music Perception and Cognition. Many scientists and researchers from around the world descended on Music City to attend the five-day meeting, attending lectures, presentations, symposiums, and other events. The week’s activities are a means for scientists, musicians, and others to share and learn about the many facets of current research in music understanding from a far-flung collection of fields including music theory, psychology, psychophysics, linguistics, neurology, neurophysiology, ethology, ethnomusicology, artificial intelligence, computer technology, physics, and engineering. 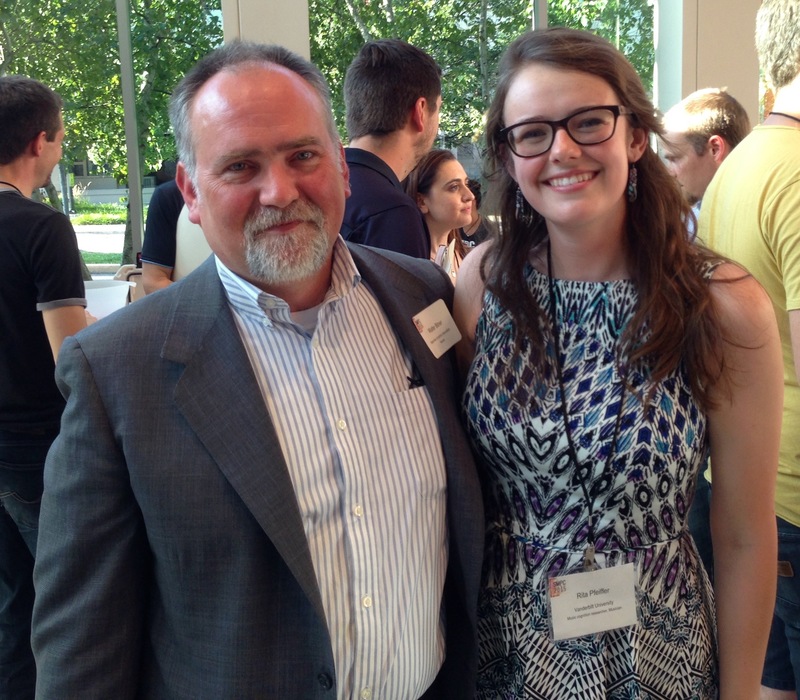 On Saturday, August 1, Kelley Bell (Nashville Symphony Education & Community Engagement Program Manager) and I attended the Music & Mind Kickoff event on the opening day of the conference, which was held at Blair School of Music’s Ingram Hall. The talks and entertainments presented in Ingram Hall on Saturday included a wide variety of speakers from various departments at Vanderbilt, describing as succinctly as possible the spectrum of music research being done in the sciences at Vanderbilt for both those of us locals who attended (who knew all of this was going on in our own backyard?) as well as the many visiting experts. After welcoming remarks by Vanderbilt Brain Institute Director Dr. Mark Wallace, the Kickoff began with a performance by So We Are: Dr. Joseph LeDoux, a neuroscientist who teaches at NYU and Colin Dempsey, an Irish singer-songwriter. The So We Are duo sing (accompanying themselves on guitars) original songs about brain and psychological disorders. They were joined for several numbers by veteran Nashville session musician Pete Finney on pedal steel – which was superb! Pete is also co-curator of the current exhibit Dylan, Cash, and the Nashville Cats at the Country Music Hall of Fame. So We Are was introduced and interviewed throughout the set by Dr. Nicole Baganz, a postdoc fellow in the Vanderbilt Department of Pharmacology. Following the musical introduction, we heard sixteen four-minute “lightning talks” from Vanderbilt physicians, faculty and other staff describing the wide variety of research and innovative programs being conducted here in town that directly relate to the Kickoff theme of Music & Mind. The Vanderbilt professionals we heard from did an incredible job of laying out the plethora of cutting edge activities relating to music and the sciences happening right under our very noses, so to speak. The complete list of lightning talk topics can be found here on the SMPC Conference Kickoff webpage. A short break followed the lightning talks. The second half of the afternoon began with another musical interlude: a remarkable quartet of 8-12 year-olds led by local musician and teacher Deanie Richardson performed Old-time and Irish tunes (as well as Deeper Well by celebrated local songwriter David Olney) to a rapt audience. 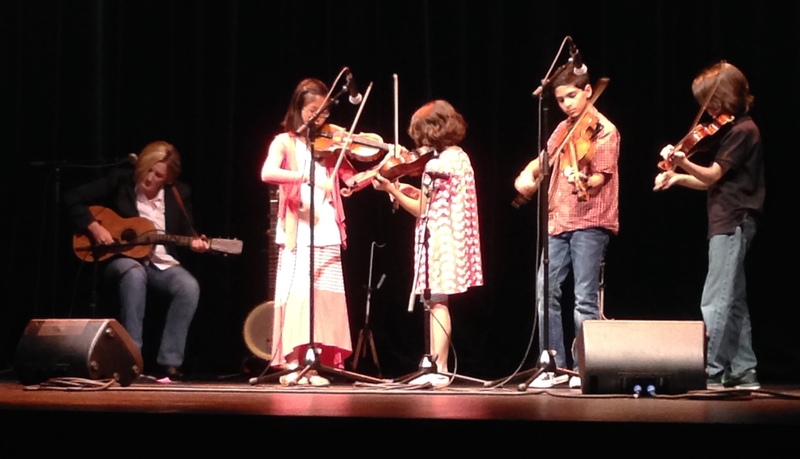 All four children played fiddle with dexterity and musicianship – two of them doubling on banjo and mandolin for a couple tunes – and their set was versatile and tight. Included in Dr. Limb’s account of his work were detailed descriptions of his projects with rap freestylers and with the phenomenal classical and jazz pianist Gabriela Montero. 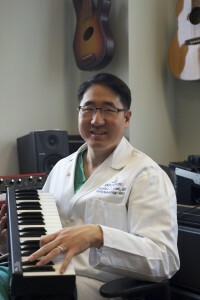 It is clear that Dr. Limb has great enthusiasm for his probing and inventive work, and that he has already made great contributions to our understanding of differences in how the brain functions during musical activities. It was a fun, and incredibly informative event featuring a great variety of live music, enthralling speeches, and brilliant PowerPoints. I was thrilled during the reception to run into a former student from my Music City Youth Orchestra days, now a graduate student performing research in one of the Vanderbilt labs described during the afternoon’s “lightning talks”. All of this, one Saturday afternoon in Music City. By walterbitner in Community, Music on August 7, 2015 .